While you are desperately trying to protect your lies, remember that lies never last for ever. I guess you enjoy been called OHANAEZE and love to remain in her enclave, but actually and very unfortunately too you ( OHANAEZE) fail to ponder on the meaning of the name you bear and what it is supposed to represent. When you go about displaying as madmen your nakedness in public, who will you blame for your ridicule? When you can publicly expose your inadequacies and dishonesty, who will bail the cat? For years, you have without shame or clear conscience cheated on your people with deceit. They have been kept in the dark concerning their fruitless fate in this British born, Nigeria. They have been cheated out of the gains from their bountiful resources. They have been neglected, relegated, denigrated, abused, murdered and oppressed, yet you felt comfortable in your coveteous zones, collecting peanuts like Judas Iscariot and selling out your people for financial and political gains. Well, not anymore! Faking days are over! Biafra has arrived and with her, the TRUTH that has destabilized Nigeria. That same truth will quash your greediness and expose your lies. Do not pretentiously politicize the threat by the Niger Delta Avengers(NDA). It was a direct address to the Eastern state governors and I know you are not their mouthpieces. There will no longer be political gains for you because like naked wires, the truth will be bared and your hypocrisy will be spread as sheets for the entire populace to see. 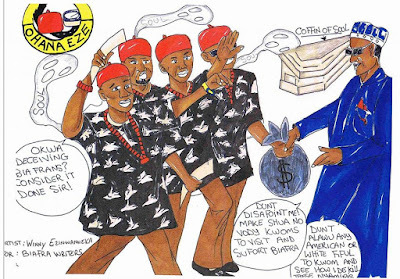 RELATED POST: OHANAEZE NDI IGBO...THE GREATEST OBSTACLE TO BIAFRA RESTORATION... Must Be Removed!!! What were you thinking when you opened big mouths to say no Biafran agitator was detained in the state. When did Ohaneze become the public relations officer of the Nigerian police. Many have been massacred in these past months and their bodies were disposed as waste products by the military personnel in the state, you never spoke anything about it. Therefore, you have no right to fabricate lies in this matter that you never initially displayed any interest in. You were supposed to protect the OHA [the people] but all you wanted and still want is to bear the EZE [the king] title attached to it. Anyways, my candid advice is that you mind your shameful acts as you await damnation in the nearest future when when you will account for your misdeeds. Solemnly I call on Abia state governor, Okezie Ikpeazu, to tell us where these Biafrans are locked up and the many more who have not been mentioned yet. We have our records and evidences. Such witnesses do not lie. It would be better if these innocent, oppressed, suppressed and incarcerated Biafrans be revealed, revisited and released. You have been warned enough. These twenty- one names are just a few of the victims locked up in various cells in Abia state alone. OHANAEZE, what will you say to this? Who will pay you for trying to tell impossible lies? Be warned and stay clear of IPOB matters before nemesis catch up with you.